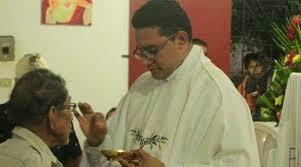 A Catholic Priest in El Salvador was killed during Holy Week. A 31-year-old priest was shot during a suspected may be a gang killing. Father Walter Vasquez Jimenez was traveling with parishioners on March 29 to celebrate a Holy Thursday Mass in San Miguel. Then their car was stopped by an armed men wearing masks. All the passengers were set free after their belongings were taken, but Vasquez was taken. He was then shot and left to die. Fr. Vasquez belonged to the Diocese of Santiago de Maria in El Salvador. “We’re shocked and very worried about what’s taken place,” said San Salvador Archbishop Jose Luis Escobar Alas.The priest had been threatened previously by gangs. Archbishop Escobar said he wanted “justice,”.